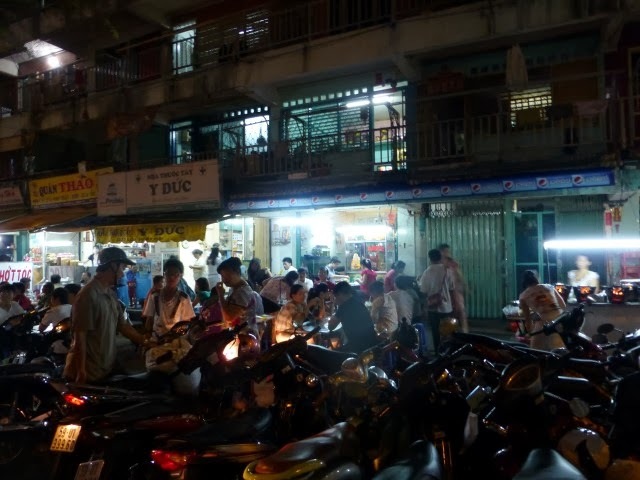 One of the more popular items we found when searching for activities in Ho Chi Minh City was a motorbike tour — a motorbike food tour. Score. We decided to book with Back of the Bike Tours. 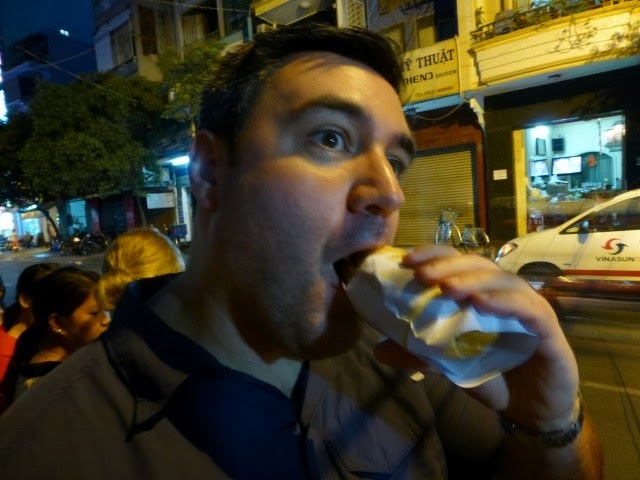 This tour was designed by an American Chef, who worked at Alinea (consistently ranked one of the best restaurants in the world and located in Chicago) and lived in the Vietnamese neighborhood in Chicago. He fell in love with Vietnamese food and decided to visit Vietnam – where he fell in love with the country, the people and a young woman. The tour starts by picking you up at your hotel. You meet your driver, most of which are young women – the story is that young women are safer drivers. We are riding on the back of our driver’s personal motorbike and we are assigned to the same driver for the whole night. No one in our group had ever spent much time (if any) on a motorbike before. We were a bit apprehensive at first, but after we met our guides our fears were definitely lessened. The bikes we’ll be riding throughout the evening. 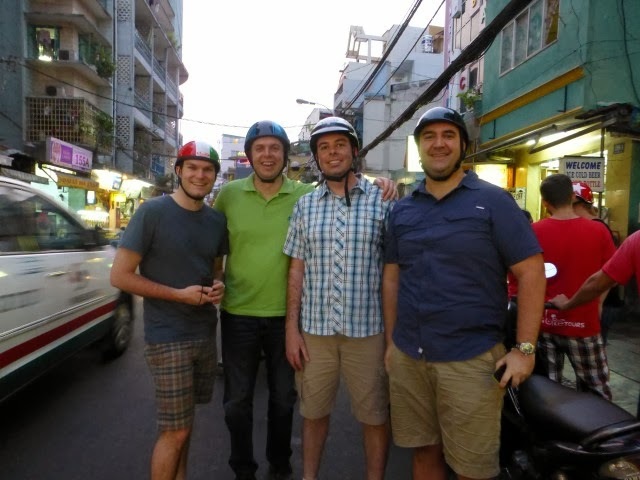 All prepped for the dinner tour – including safety helmets. Our guides were so nice, so welcoming and put us all at ease so quickly. Our tour leader (the owner) explained the plan for the evening, which included 6 different stops. All the food and all the drink we wanted were included in the price. 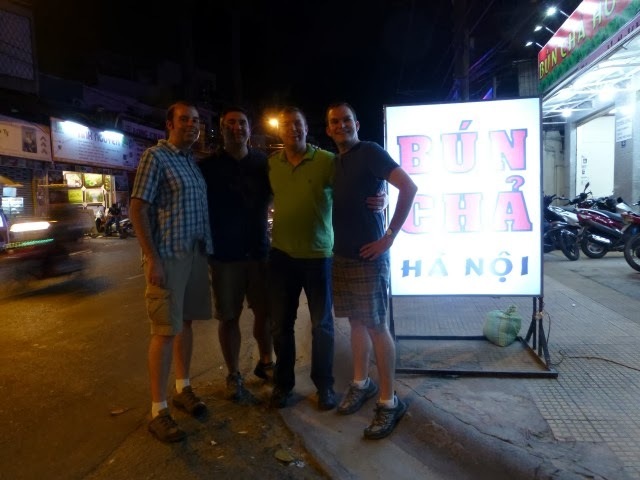 He told us he could give us the names and addresses of the restaurants we’d visit, but he guaranteed we’d almost never find them again. These places were off the beaten path, but just a few meters from major roads. 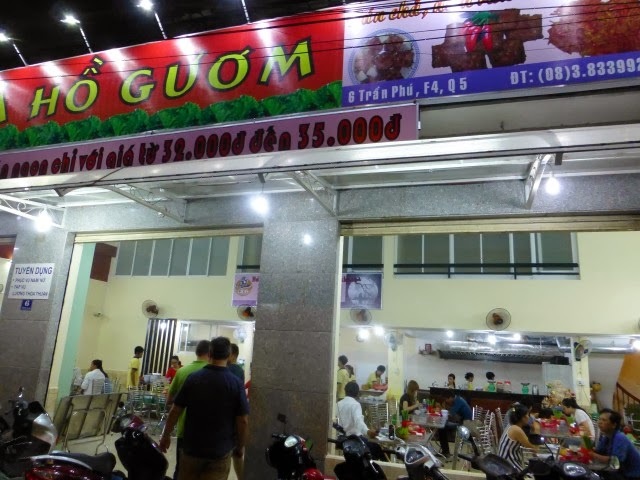 He also guaranteed that the restaurants would be full of locals and nearly no westerners. 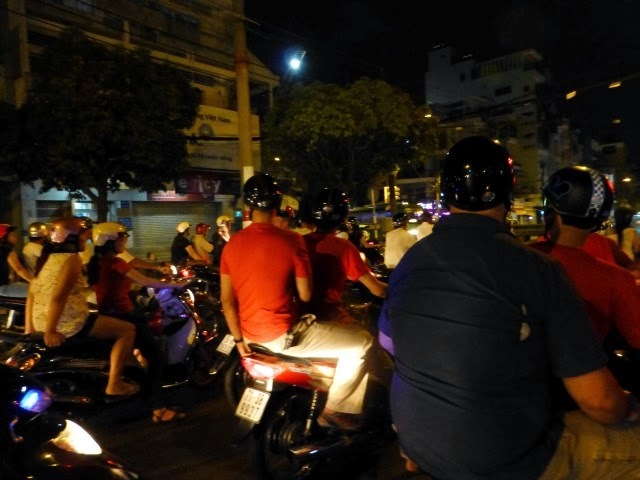 As we headed out, we held on for dear life and snaked our way through the crowded streets of Ho Chi Minh City. Weaving our way through traffic around round-abouts and after a couple near-misses we made our way to our first stop. 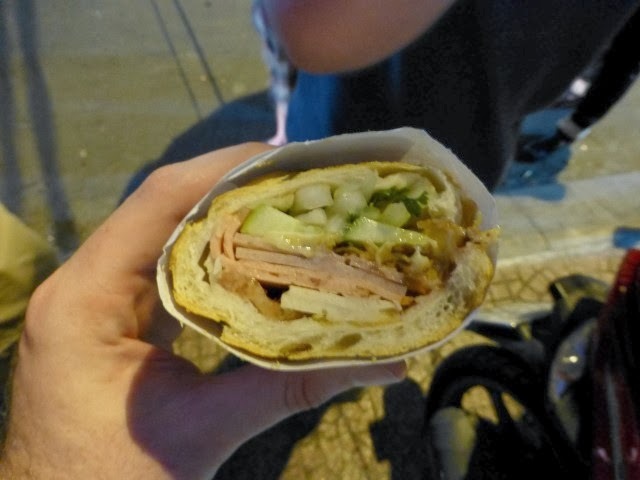 A traditional Banh Mi (Vietnamese sandwich served on a baguette). We each had half a sandwich (about 4″ long) with pâté, peppers, pork, cilantro and pickled vegetables. This was really great – so flavorful, so fresh. One of our group is gluten free, so when we told our guide this, he immediately found an alternate meal for him. Our second stop was harder to describe. We sat upstairs, had some beers and tried a few different sausages, meat spreads and veggies. 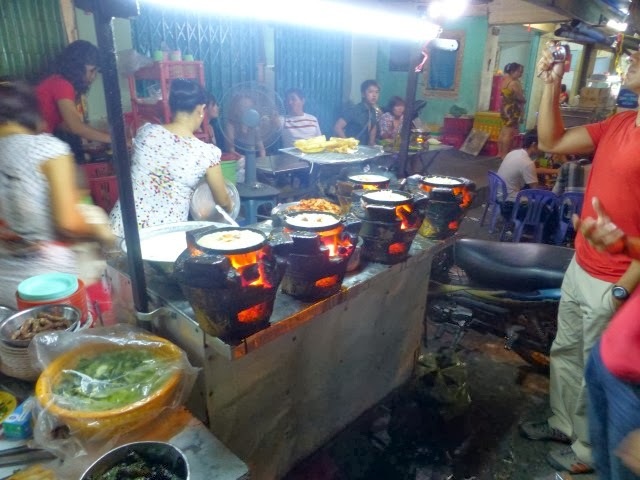 Everything was really good here too – I really didn’t know what some of the items were, but our leader and guides described them the best they could – moreover describing the taste versus the composition of the dish. It was at this stop that we really got to sit down and talk with the leader of our group (who is also the owner of the tour company). He told us of his passion for Vietnam, for the people, the food, everything. 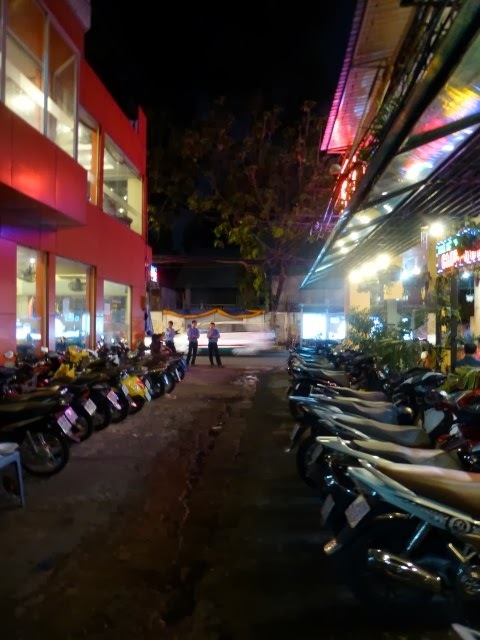 The alley leading to our second stop, ample motorbike parking. 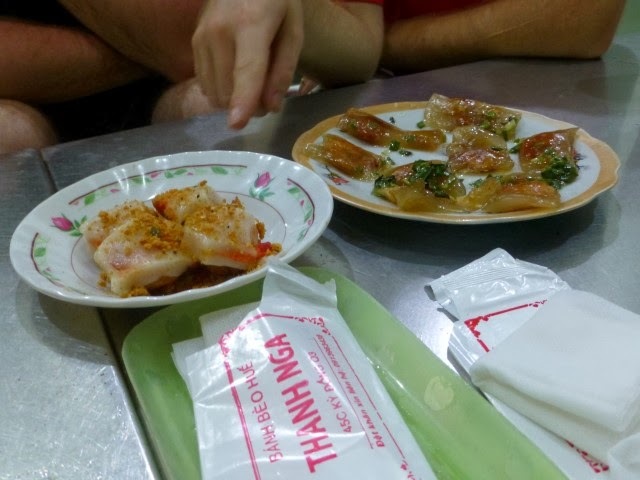 It’s unclear what we were eating, but it was very tasty. 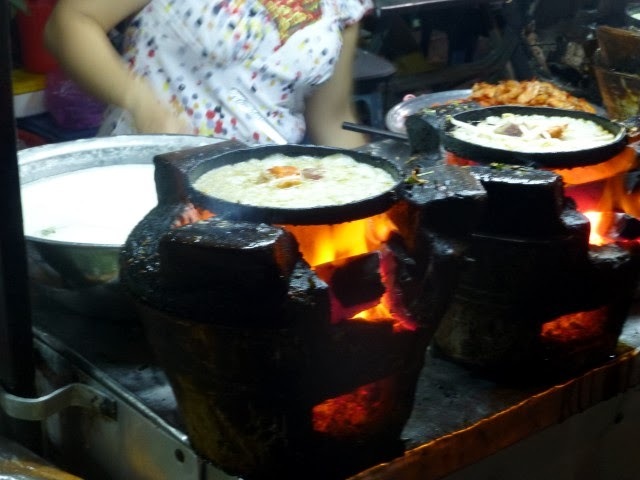 Our third stop was an outdoor area, where we had this amazing Vietnamese crepes – these were very eggy, so it seemed more like an omelette. 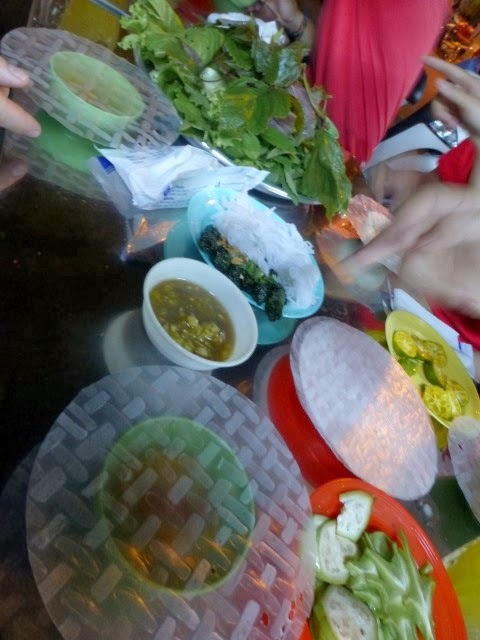 Our guides showed us how to eat these, with the various herbs, vegetables all wrapped in a lettuce leaf. I must admit, I was a little concerned about eating the herbs and veggies, I decided to give it a go and low and behold, no GI issues. I did get advice from our tour leader (the American) and he assured me that these restaurants were among the cleanest around. Large group of people loving the crepe stop. All the fixins’ for the crepes. some amazing sugar cane juice. 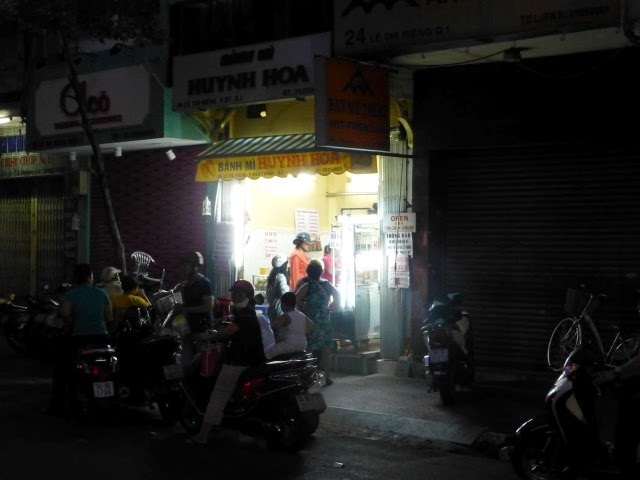 The next place we hit was probably my least favorite and it was a bun (noodle) shop. 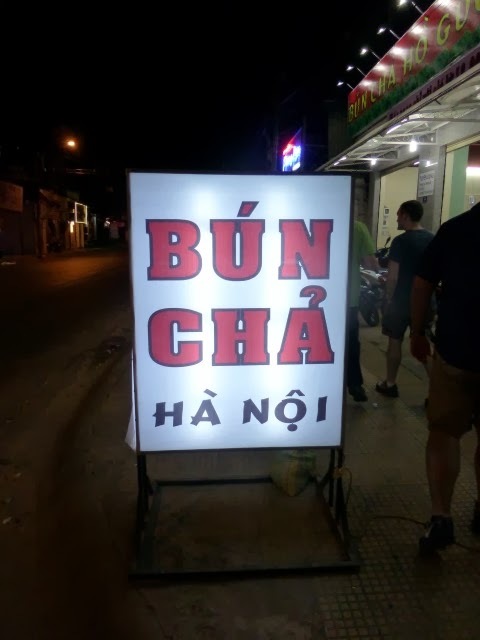 While this food was good, we had much better bun in Hanoi. This place was also so brightly lit, it felt a little sterile – like an operating room. Name of the Bun shop where we had dinner. Our group posing after dinner. Our final stop was along a major thoroughfare for dessert. We had some puddings, some durian and a couple very sweet drinks. 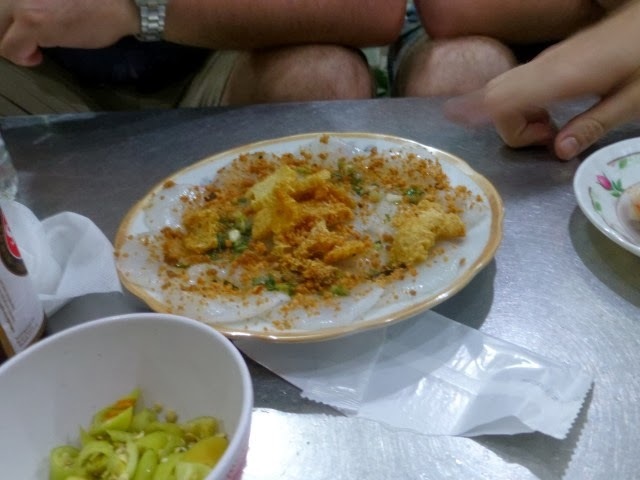 The durian, which most of the Vietnamese guides hated, didn’t taste too bad to me. It wasn’t like I had heard, so miserable and disgusting that it would turn your stomach. I probably wouldn’t order it on my own, but it wasn’t all that bad. Street at our final stop. The tour ended about 3 hours after we started with us being driven back to our hotel. 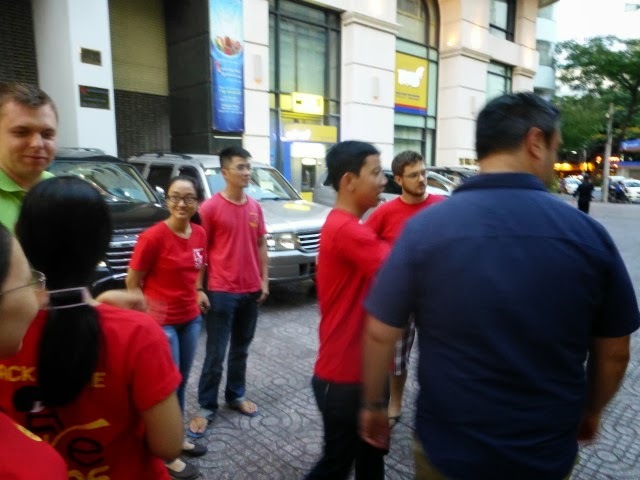 We said good bye to our tour guides, who we really got to know over these few hours. We talked about our lives, our studies, our dreams, etc. 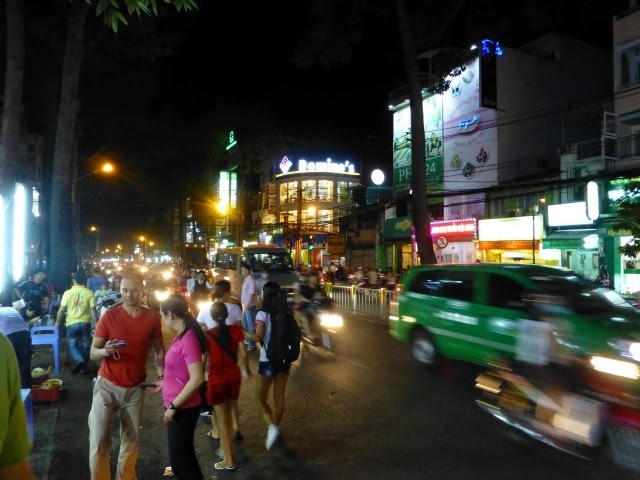 My guide wanted to travel and her goal, was to visit Bangkok. I asked if she thought about going to the US or to Europe and that question really shocked her. She said she never thought that would ever be a possibility, but if she worked hard she might be able to visit Thailand. That was really surprising to me. Growing up in the US, I always knew that I could go anywhere I wanted, if I just saved and planned the trip. It is such a foreign idea to be restricted on where we could go. This trip was fantastic, not only did we get to eat some amazing food, travel like the locals, meet people who were passionate about the country, food and really just living life, but we got to meet people who while very different from us, they had the same wants, needs and dreams. This really is what travel is all about, isn’t it? Have you ever done a motorbike tour? 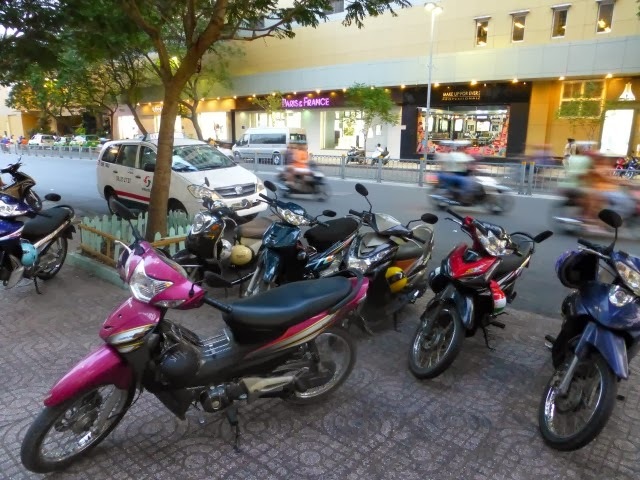 Does the idea of riding a bike throughout Saigon terrify you? 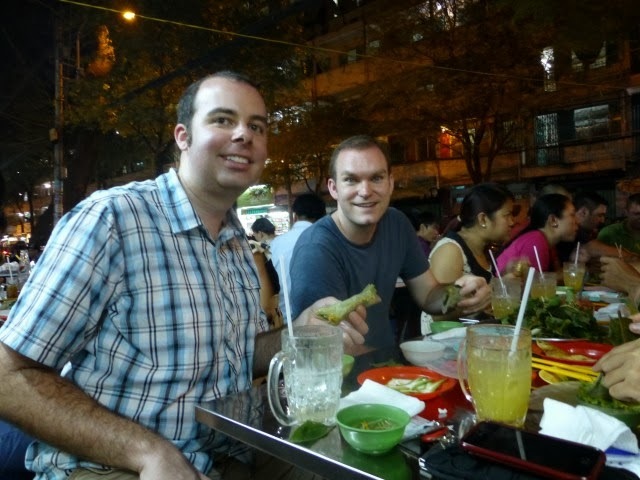 When visiting a new City do you try to hit up the local eateries or do you stick to things you are more use to? By Tim in Travel on November 11, 2013 .